I return from Portland judging for the Columbia Agility Team in southern Washington, and have survived the red-eye. Though there was certainly a day of tired brain and discombobulation. Below I’ll share with you one of two Masters Gamblers riddles I put up on the weekend. I was just a little bit disappointed in the qualifying rate; because, don’t you know tunnel-jump/tunnel-jump sounds a lot like a Starters gamble. To be sure the gamble featured an implicit change of directions and an obstacle discrimination. So for sure it is a test of Masters skills. 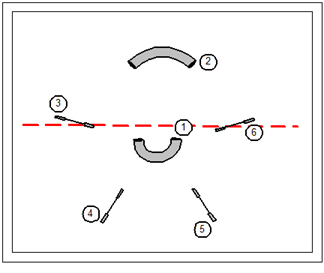 Coincidentally, just a few days ago in this blog space I published a discussion of teaching the Tandem Turn (http://wp.me/pmSZZ-1ji) which is a simple skill used to turn the dog away from the side the handler is working. This is to my thinking a very basic, necessary and fundamental movement in a handler’s repertoire. I’ve been teaching this skill for maybe 20 years. I reckon just about everyone who has ever trained with me has it mastered. 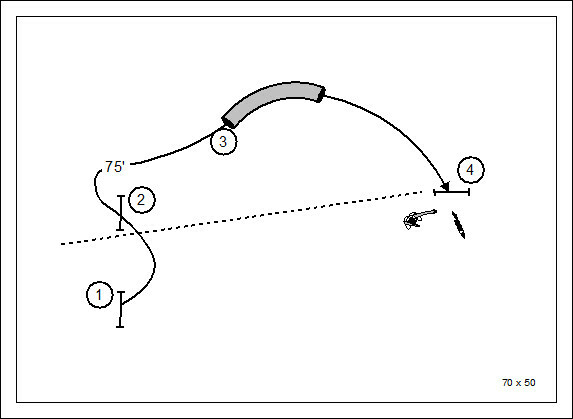 The biggest mistake handler’s made in this gamble was making the approach to the start of the gamble from the jump immediately to the right of the #1 pipe tunnel. As the handler really needs to be at “X” to sell the change of directions, the approach should have been made from the jump I’ve colored red in this drawing. This judicious use of real estate allows the handler to send the dog up to the tunnel and move to the control position. In a Tandem (getting the dog to turn away) the handler should reserve enough room to take a strong step or two in the direction of the turn. And so it was a huge error for any handler to arrive at the jump all velcro’d against the dog’s path with no room to take a step. 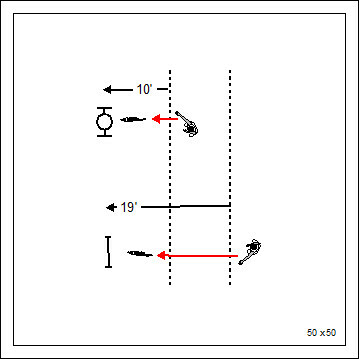 The lateral distance is especially important to handlers who use mostly relative directionals to direct their dogs. Key to convincing the dog into the turn is to actually make it look like you’re turning a corner with a sense of purpose and even urgency. 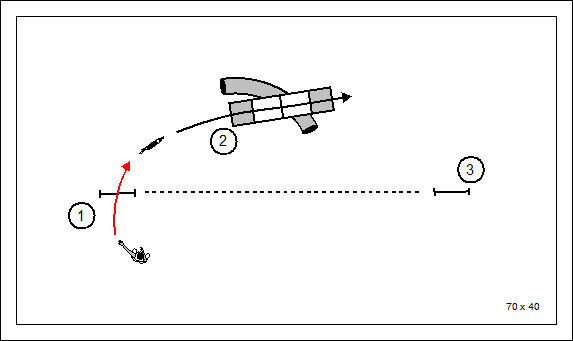 The most impressive attribute of the Tandem turn is that it creates acceleration and separation. Sell it to the dog. And I thought this gamble was going to be about the “named obstacle recognition” in the discrimination. I’d like to have a discussion about the other gamble as well. But we have the Petit Prix (the very most amazing small dog agility event) next week and a lot of chores and obligations I need to catch up with because I’ve been gallivanting around the country. I’ll get back to it when I can come up for air. I have this really cool fantasy about a reality show for television. On this program several dog agility trainers will each work with a big Hollywood celebrity to teach them how to run an agility dog. And then we have an agility competition with the celebs and their borrowed dogs. I’ve got first dibs on Mark Wahlberg! He can run my boy Kory (or even Marsha’s Phoenix). I’m comfortable taking on any smart aleck agility trainer in the business to train up a celeb to beat us! I believe Mark could be a hell of an agility handler. It’s just a hunch. I’m sorry that we’re not capturing the full granularity of Cedar’s ongoing training. By rights we’d be filming twice a day. We are only filming about every other day. So you miss some of the incremental steps we take in the training. Here: http://youtu.be/J4EoJXrAANs. We’ve progressed to three hoops. As she becomes comfortable with our performance expectations and begins to own the exercise, we’ll move them farther and farther apart. I fully expect that in about a month I’ll be sending Cedar straight away from me a good 40′. . The dead-away send is truly one of the most difficult distance challenges in agility. The training methodology we’re using here is completely documented in The Joker’s Notebook, which is available on my web-store. The cool thing about distance training is that all skills that we own with our dogs are earned and deserved through training and practice. If you take the time to establish the foundation, you will have those special skills. I’m fairly excited by developments with Top Dog. I’m sorry to say that it’s all secret and amazing. You’ll just have to take my word for it. Working a dog at a distance basically means that the dog has been taught his job and doesn’t require the handler to always be forward and always “dragging” the dog through every performance. The dog should be taught his job for every obstacle with no requirement that the handler be embedded in the context of the performance. I’d be delighted to write a primer on the subject. That’s too big a job for this one blog. So the following is hardly comprehensive. I will write more on it and put it all together in the fullness of time. The handler’s job is to direct the dog. An important part of the distance riddle is how the handler provides direction. The easy answer to this is that the handler provides focus, verbalization and movement to frame the objective obstacle. Focus is what the handler is looking at and pointing at. Note that pointing is not really a wagging finger. It is more defined by the set of the handler’s shoulders, hips and toes. Verbalization is the verbal command or imperative annunciated by the handler to cue the dog to the objective obstacle. Movement rightly belongs at the top of the list. The pressure of movement surely gives the dog his directional cues. The handlers movement tells the dog both where “we” are moving, but how quickly we intend to get there. If it’s true that movement is the most fundamental cue to direct the dog, then we’d have to assume that sending the dog straight away (the “dead away” send) is the most difficult kind of distance challenge. In a gamblers’ class the judge will draw what’s called the “handler containment” line. The gamble/distance challenge is negated if the handler steps over that line. In this drawing a 10′ line and a 19′ line are shown. Obviously the 19′ line is the greater challenge. How does the line not remove movement… the most important directive or cue for the dog to continue on working? The handler’s movement should be calculated to arrive just short of the line at about the moment the dog is arriving at the objective obstacle. All skills are earned through training and practice. At the bottom of my blog in that little section “Questions comments & impassioned speeches” I routinely point to series of books I’ve written on distance training. If you need a series of exercises that lead to amazing distance skills… read and do the exercises in the 5 volumes of The Joker’s Notebook. A typical kind of gamble that appears in distance classes of every sort is the parallel path. 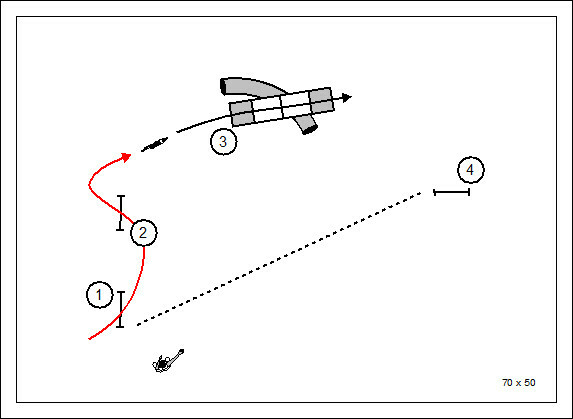 In this drawing, after the initial send, the dog and handler work for some distance in parallel. The course designer has to determine where the handler’s containment line should be, relative to the obstacles being performed at a lateral distance. Dogs at different levels might do the same series of obstacles, but at distances appropriate to the level of players. 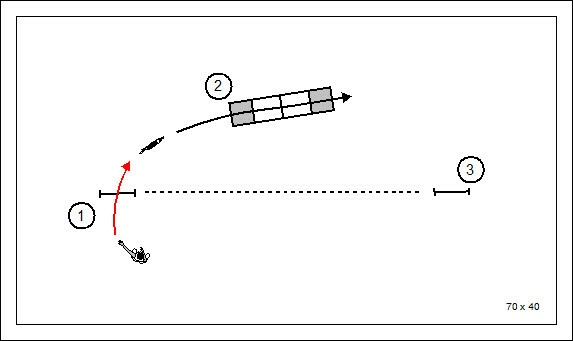 The parallel path gamble is made more challenging by the use of a technical obstacle (contacts and weaves) at the parallel distance. This is probably not an appropriate challenge for Novice/Games I players. 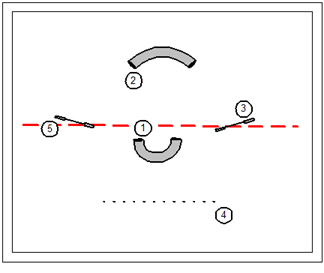 But surely, Advanced/GII players can show off their training with this simple distance challenge. One of the real complications in terms of the handler’s movement (required to direct the dog) is woven into the context of the handler’s application of that movement to assist the dog in the performance of the technical obstacle. Without careful training, the dog mightn’t understand the movement at any appreciable distance. When a technical obstacle is used dogs should be judged by performance rules and faults appropriate to their level. In a numbered sequence the A-frame, in this example, is eligible to earn the dog a refusal fault, which would negate the gamble. 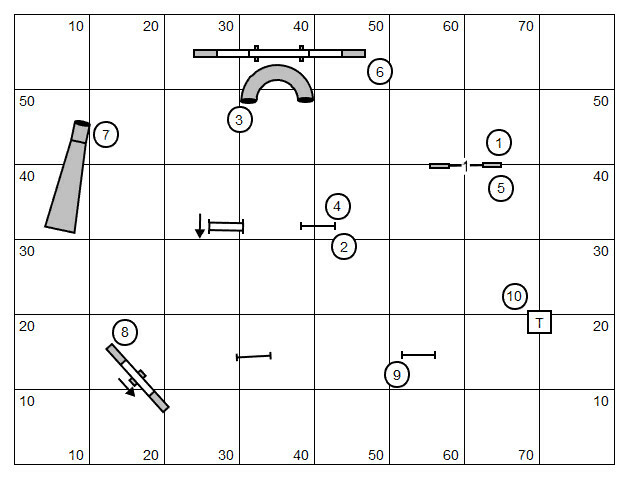 The course designer can raise the caliber of the challenge a bit by giving the dog a discrimination challenge in the performance of the technical obstacle at a lateral distance. This distance challenge begins with a “change of direction” challenge at an appreciable distance. This is a fairly tough kind of challenge, to be reserved for the Masters of our sport. Not only does the gamble feature a change of direction, but also a technical obstacle at a distance, and a discrimination challenge. It’s hard to get much more evil that this. 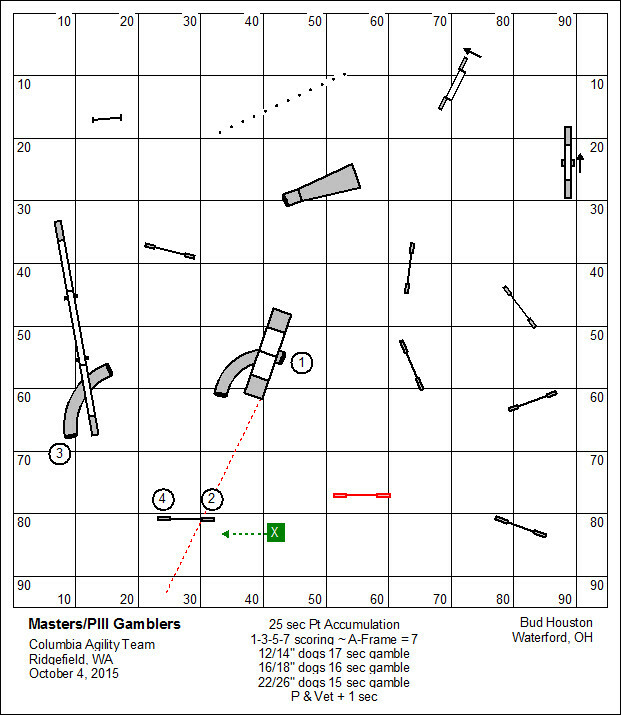 The Masters/GIII challenge doesn’t have to be anything more than a change of directions (at a distance), or a discrimination challenge (at a distance), or the performance of a technical obstacle (at a distance). The course designer really doesn’t have to do all three in one gamble! I’ve softened the previously drawn gamble challenge (considerably), mostly to talk about how times are assigned for performance of the gamble. 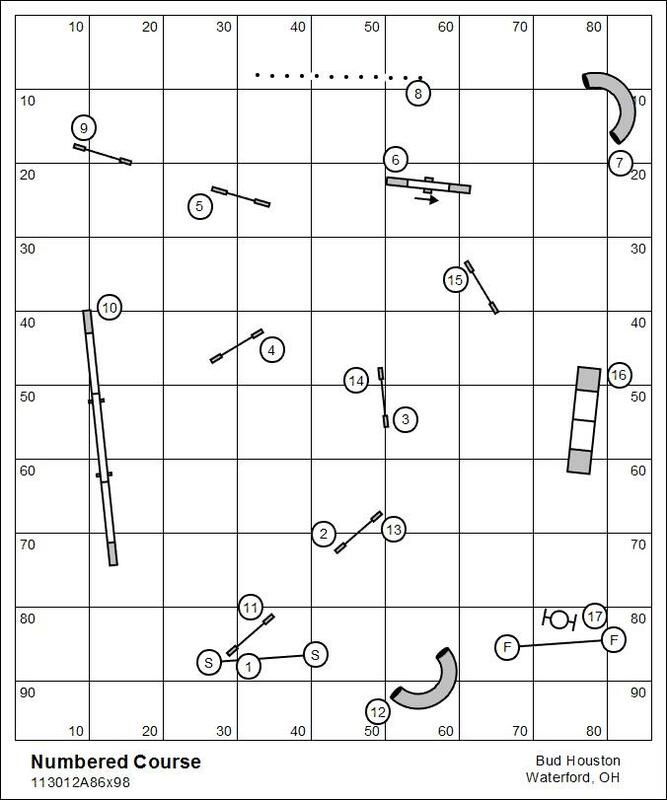 In general the judge would take the wheeled distance of the dog’s path and then add 5 to 7 seconds to allow the handler to move the dog into position to begin the gamble. Using this logic this gamble would be in the range of 13 to 15 seconds for dogs with 3 YPS (three yards per second) rate of travel. The course designer should acknowledge that turning the dog degrades the dog’s rate of travel. So we might add a second for the two turns that initiate the gamble. Technical obstacles also degrade the dog’s rate of travel. So for each contact obstacle you might add 2 seconds. For the weave poles, add 3 seconds. Please note that the sequences I’ve designed here are “big dog” distances. The distances between obstacles would be considerably tighter in the TDAA. 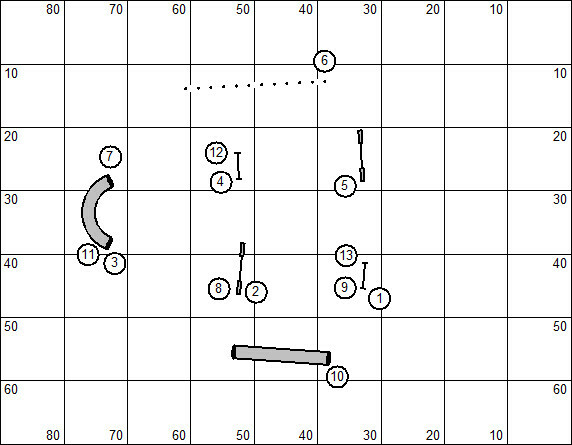 A minimum of 12′ to solve wrong course options, or on the approach to a technical challenge, or when requiring the dog to turn. The TDAA course designer should also give the working dog credit for some distance working skill. I’ve reviewed courses in which the “distance challenge” was no more than 18”. That’s not really a distance challenge. I’ve been loading thing up for a couple weeks now for a yard-sale at my in-laws place down in Williamstown, WV. Click HERE for details! 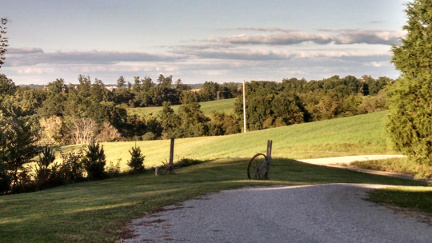 Here’s a picture from our front porch that I took a couple days ago. Fall has arrived with an abrupt turn in the temperature, chilling just enough to scare the tomatoes and make the humming birds consider the southern horizon. It’s a beautiful view and begs for sitting on the porch in the morning with a hot cup of coffee, wearing your robe a bit longer into the day than most people do. Hey, I have a couple events up and coming that will take me to Latrobe, PA. Obviously, there is the 2014 TDAA Petit Prix my very favorite agility event. That’s like six weeks away. For two days before the Petit Prix we’ll be doing the warm-up workshop. I get to work with canny competitors to gear them up for the tournament and give them a competitive edge in understanding the strategies of the games we’ll be playing. There might be a couple working slots still available. Contact Marsha Houston.Marsha@gmail.com for information. This Saturday we’re doing a Top Dog league intro in Latrobe. I have no idea if anybody is actually going to show up. I didn’t take advanced reservations (because it’s not my league). But we’re going to film it with our vague notion of a reality show; and we’re going to play three games. It’ll be fun discovering who the Latrobe league team will be for the September Top Dog Challenge. Now, if you’ve read down this far you’re actually reading my blog. I can loosen my tongue and not have to sound like I’m selling something. I have this vision you know, of an inexpensive/recreational approach to the game of dog agility. These are terms that easily slip off the tongue but don’t have much real definition in the world. So let me put it like this, I’m a semi-retired man living in a cabin in the country. I have half a dozen continuing students. My wife and I run a small but very fun agility organization. And I subsist by the occasional seminar and selling ebooks for training dogs in agility. And you know, I can’t really afford to do dog agility like I want to. Agility trialing is like 10 times more expensive than a golfing habit. I’m trying to create in Top Dog a model for play of the game that is as inexpensive and natural as a pick-up game of softball in the corner lot. Very few people really understand Top Dog. There’s plenty of information out there; I know because I’ve published it. But dang, we’re in the age of information over-load. Being semi-retired I’m not in any hurry. I know that this new lonely outcast idea has to be built a brick at a time, a dog at a time, a club at a time. The weekend following the Top Dog intro in Latrobe, I’m going to invite a bunch of people to our place here in Watertown to run the challenge courses. This might be the last bit we can do outside this year. I pulled out an old skills exercise for our class this past week. 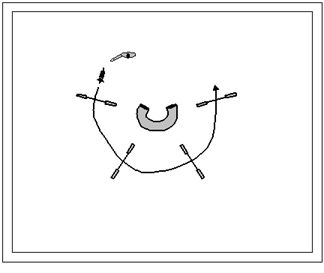 This set-up is used for teaching the Tandem Turn which, as you should know, is a form of the rear cross in which the handler crosses behind his dog on the dismount of an obstacle, or on the flat. We filmed most of the exercises (I bought a new camera last month!) I’m thinking that I want to make a DVD though I have no experience or particular expertise at that kind of publishing. I do know how to teach people to be master handlers… and that is the bit I’d like to share. It seems like a lot of work and bandwidth to put it all up as YouTube. I had a private camp here this week, working with a group of ladies from Ft. Wayne, IN. Fairly early on the instruction revolved around distance training. We fall into this interesting pattern in agility. By focusing on the technical and handling we dispose the dog to come to an understanding that the game is supposed to be played at the hip of the handler. If the dog is tied to the handler’s hip, then his speed will always be limited to the speed of the handler and of the hip. The dog’s trainer should endeavor instead, and early in the dog’s training, to give permission to work at a distance. If we dispose the dog to come to this understanding of the game, then the game can be played at the speed of the dog. Following is a simple exercise intended solely to tear apart the Velcro fabric that sticks the dog against the handler. Remember that Velcro is a two-part fabric. And it takes both parts for a good stick. 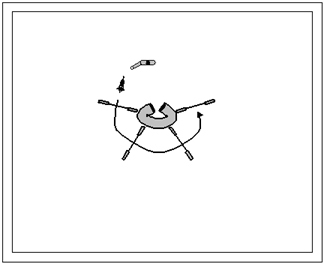 This is a form of the exploding pinwheel exercise. We use a pipe tunnel rolled up like a garden pill-bug to shape the dog’s movement at a distance. Initially the dog has few options except to work through the jumps to make his way back to the handler. 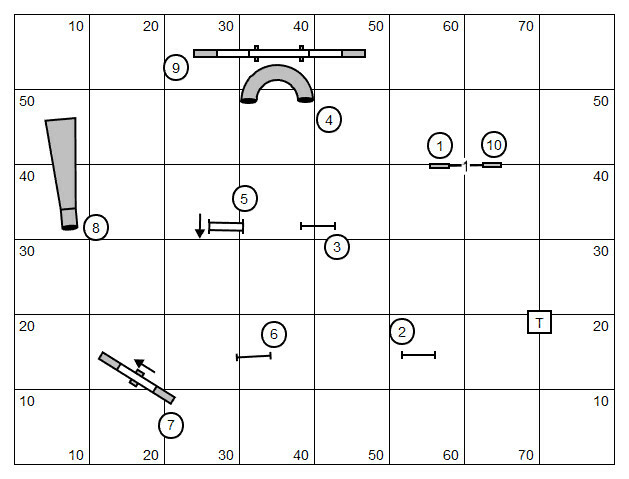 Only gradually are the jumps moved away from the pipe tunnel at the center of the exercise. As the jumps are spread apart the pipe tunnel should be opened up, just a bit at a time. The biggest difficulty I have with students who are introduced to this exercise early on is that they won’t know which direction to face when sending a dog into a pinwheel. The handler is conditioned to face his shoulders as though moving parallel to the dog. However, if not actually moving, the handler should face each jump, in turn, as the dog works his way around the pinwheel. Note that for the first three jumps the handler pretty much faces the same direction. Now the pinwheel is fully exploded and the pipe tunnel at the center has been opened up to its full size. I’ve brought in a second pipe tunnel to create a handling flow to introduce the approach to the pinwheel. I don’t really like the idea of standing still while the dog is working at a distance. Part of the riddle becomes how to use the available real estate to maintain motion while the dog is working. The movement should be disciplined, always providing pressure to whatever obstacle the dog is working. I should have mentioned early that at each step in exploding the pinwheel the handler should work the dog in both directions so that the skill is owned ambidextrously. 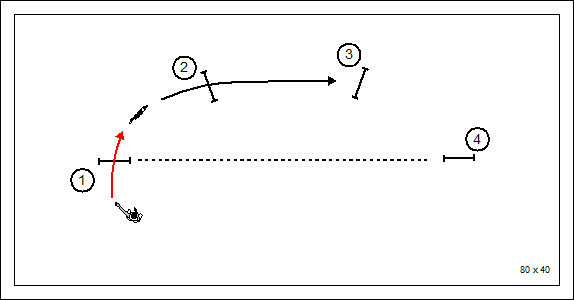 Here I’ve reversed the direction of the previous exercise. Well, that’s not all I’ve done. Since we have a dog working at a modest distance, we might as well ask him to do something a bit more advanced. This might call for a bit of development in the prerequisite skill… weaving at a distance. Some dogs won’t understand a handler working 20′ at a distance if the dog hasn’t been prepared for this possibility in training.